José M. F. Moura gave in July 2013 a keynote at the IEEE ChinaSIP, The First IEEE China Summit & International Conference on Signal and Information Processing, Beijing, China, July 6-10, 2013. He gave the Booz|Allen|Hamilton Distinguished Colloqium in Electrical and Computer Engineering, University of Maryland, College Park, October 19, 2012, an Invited Seminar, Washington University at St. Louis, St. Louis, Jun 15, 2012, an Invited Seminar, Indian Institute of Information Technologies, Hyderabad, July 30, 2012, an Invited Seminar, CR Rao Institute of Mathematics, Statistics and Computer Science, Hyderabad, July 28, 2012, he was an Invited Speaker, International Conference Signal Processing and Communications, Indian Institute of Science, Bangalore, India, July 23, 2012. He gave the IAPR Invited Lecture, CIP, 3rd International Workshop on Cognitive Information Processing, Parador de Baiona, Baiona, Spain, May 28-30, 2012. Moura was a plenary speaker at theIEEE Fourth International Workshop on Computational Advances in Multi-Sensor Adaptive Processing (CAMSAP), Dec13-16, 2011, San Juan, Puerto Rico, and the International Conference on Image Analysis and Signal Processing, Oct 19-23 Huazhong Normal University. Peoples Republic of China, and at the International Symposium on Image and Signal Processing and Analysis, Sep 4-6, Dubrovnik, Croatia. He was an invited sepaker at theFoundations of Computational Mathematics Conference, Workshop on Flocking, Swarming, and Control of Distributed Systems, Jul 8-10, Budapest, Hungary. He gave invited seminars at University of Maryland College Park (Nov 4, 2011), at KTH Royal Institute of Technology (ACCESS Distinguished Lecture, Sep 9, 2011) (Sweden), at the University of Pennsylvania (April 25, 2011), Philadelphia, PA. He gave an invited talk at the IEEE Information Theory and Applications Workshop, Feb 10, University of California at San Diego, La Jolla, CA. He was the speaker at the Harvard University, Electrical Engineering Seminar Series, Jan 18, 2011, Cambridge, MA. He gave invited seminars at École Polytechnique Federale de Lausanne (EPFL),Lausanne, Switzerland on Oct 8, 2010, on Sep 28 atThe Chinese University of Hong Kong, Hong Kong, on Jul 30 the Systems and Control Series Seminar at the RSISE, The Australian National University (ANU). 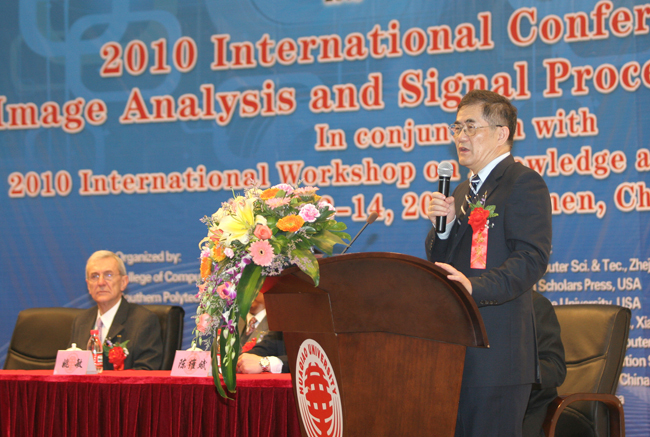 He gave an invited lecture at Universidad Carlos III on June 25, 2010, Madrid, a keynote at the 2010 International Conference on Image Analysis and Signal Processing (April 13, 14, 20010), Xiamen, China (see also announcement, and photo 1, 341KBytes, also photo 2, 71 KBytes) a seminar atHuaqiao University (April 15, 2010, Xiamen, China,) and a seminar at Tsinghua University (April 16, 2010, Beijing, China.) He was an Invited Speaker at the Third International Workshop on Computational Advances in Multi-Sensor Adaptive Processing, (CAMSAP, Dec 13-16, 2009),the Plenary Speaker at the 1st IFAC Workshop on Estimation and Control of Networked Systems, Centro Culturale, Don Orione Artigianelli, Venice, Italy, Sep 24-27, 2009, an Invited Speaker at the Multimedia, Mathematics, and Machine learning II,BIRS, Banf, Alberta, Canada, Jul 6, 2009, Plenary Speaker at the International Symposium on Signals, Circuits, and Systems, Technical University Iasi, Iasi, Romania, July 9-10, 2009, and a keynote speaker at the IEEE DSP Workshop, Marco Island, Florida on January 4-7, 2009. The IEEE Fourth International Workshop on Computational Advances in Multi-Sensor Adaptive Processing (CAMSAP), Plenary Speaker, San Juan, Puerto Rico, Dec 13-16, 2011.
International Conference on Image Analysis and Signal Processing, Plenary Speaker, Huazhong Normal University; also Tsinghua University. Peoples Republic of China, Oct 19-23, 2011.
International Symposium on Signals, Circuits, and Systems, Plenary Speaker, Dubrovnik, Croatia, Sep 04-06, 2011. DASP’11, Defense Applications of Signal Processing, The Hyatt Coolum Resort, Cooling, Queensland, Australia, Invited Speaker, Jul 10-14, 2011. Foundations of Computational Mathematics Conference, Workshop on Flocking, Swarming, and Control of Distributed Systems, Invited speaker, Budapest, Hungary, Jul 8-10, 2011. 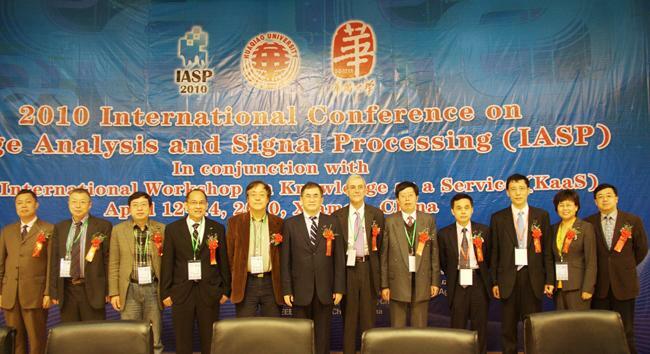 IEEE International Symposium on Signal Processing (ICASSP), Prague, Check Republic, 5 papers, one invited in Special Session, May 22-27, 2011. University of Pennsylvania, invited talk, Philadelphia, PA, Apr 26, 2011. The Information Theory and Applications Workshop, Invited talk, University of California at San Diego, La Jolla, CA, Feb 10, 2011. Harvard University, Electrical Engineering Seminar Series, Cambridge, MA, Jan 28, 2011. In the Spring of 2011, Prof. Moura introudced the new graduate level course 18-799 H Network Science: Modeling and Inference, refleceting his research interests that include Network Science, see current projects on Cognitive Networks, Global Behavior in Large Scale Systems, and on distributed inference algorithms on graphs. École Polytechnique Federale de Lausanne (EPFL), Invited Seminar, Lausanne, Switzerland, Oct 08-2010. The Chinese University of Hong Kong, Invited Seminar, Hong Kong, Sep 28, 2010. Systems and Control Series Seminar, RSISE, The Australian National University (ANU), Invited Seminar, Canberra, Australia, Jul 30, 2010. Universidad Carlos III de Madrid, Invited Seminar, Madrid, Spain, Jun 25, 2010. American Control Conference (ACC), invited paper, Baltimore, MD, Jun 30-Jul 2, 2010. Tsinghua University, Invited seminar, Beijing, Peoples Republic of China, Apr 16, 2010. Huaqiao University, Invited seminar, Xiamen, Peoples Republic of China, Apr 15, 2010. 35th IEEE International Conference on Acoustics, Speech, and Signal Processing, papers presented including two invited Special Sessions, Dallas, TX, Mar 14-19, 2010. The Third International Workshop on Computational Advances in Multi-Sensor Adaptive Processing, (CAMSAP), Invited Session, Aruba, Dutch Antilles, Dc 13-16, 2009. IEEE Signal Processing Society Dinner, Speaker, Washington DC, Oct 26, 2009. Challenges in Information Evaluation and Extrication in Distributed Sensing Systems, Panel Member, Army Research Office Workshop, MIT, Cambridge, MA, Oct 21-22, 2009. Philipp Dowd Fellowship Award, ICES, Invited Talk, Carnegie Mellon University, Pittsburgh, PA, Oct 16, 2009. 1st IFAC Workshop on Estimation and Control of Networked Systems, Invited Plenary Speaker, Centro Culturale, Don Orione Artigianelli, Venice, Italy, Sep 24-27, 2009. Multimedia, Mathematics, and Machine Learning II, Invited Speaker, BIRS, Banf, Alberta, Canada, Jul 6, 2009.
International Symposium on Signals, Circuits, and Systems, Invited Plenary Speaker, Technical University Iasi, Iasi, Romania, Jul 9-10, 2009. 34th IEEE International Conference on Acoustics, Speech, and Signal Processing, Paper in Special Session, Taipei, Taiwan, Apr, 2009. BBN, Invited Talk, Cambridge, MA, Apr 3, 2009. Association of International Education Administrators (AIEA), Invited Talk, Atlanta, GA, Feb 25, 2009. DARPA VORTEX Workshop, invited talk, Arlington, VA, Feb 18, 2009. IEEE 13th Digital Signal Processing Workshop and 5th Signal Processing for Education Workshop, Keynote speaker, Marco Island, Florida, January 4-7, 2009. Professor Moura gave a talk at the CNRS L3S, Sophie-Antiolis, France, on September 17. Professor Moura gave the keynote address at the Fifth International Conference on Networked Sensing Systems, Kanazawa, Japan on June 17. Professor Moura was the ECE Distinguished Lecturer at Tufts University and gave the ECE Colloquium on April 17. Professor Moura was the Seminar Speaker at the Department of Electrical and Systems Engineering, Washington University at St. Louis on April 11. Professor Moura was on sabbatical at MIT from September 06 through August 07 as a visiting Professor of Electrical Engineering. Moura gave an invited presentation at the Workshop on Multisensor Data Fusion, IEEE Globecom, on November 26 in Washington DC. Moura gave a Seminar at the Woods Hole Oceanographic Institute on July 26 and participated in the Microsoft Faculty Summit on July 16 and 17. He was a panel member on March 24 at the PAPS Congress, Columbia University, New York City, NY. He gave the ECE Graduate Seminar, NC State, Raleigh, NC, on March 2, 2007 and the ECE Colloquium, Boston University, Boston, February 21, 2007. He gave the Distinguished lecture, ECE, Iowa State University, Des Moines, IA, on January 22, 2007 and an Invited Seminar, at the Computing Research Institute, Computer Science Department, Purdue University, Lafayette, IN, January 19, 2007. He gave an Invited Seminar, at the Communication, Networking, Signal & Image Processing Seminar Series, Electrical and Computer Engineering Department, Purdue University, Lafayette, IN, January 18, 2007. He gave an Invited Lecture at the Mathematical Challenges and Opportunities in Sensor Networks Workshop, Institute for Pure and Applied Mathematics (IPAM), UCLA, January 10, 2007. Moura serves as President Elect of the IEEE Signal Processing Society for the two year period 2006-2007, to succeed as President in 2008-2009. Moura gave an Invited Seminar at the Stochastic Systems Group, LIDS, MIT, November 29, 2006. He gave the ECE Graduate Seminar at the University of California Los Angeles, CA, November 21, 2006. He was a Member of the NSF Committee of Visitors (COV), Computing and Communication Foundations Division, Directorate for Computer and Information Science and Engineering (CISE), June 15-16, 2006 and chaired the subpanel of the Theoretical Foundations Cluster. Professor Moura was elected a Fellow of the AAAS, the American Association for the Advancement of Science, see the ECE News. Moura was a plenary speaker at the New Horizons Workshop on March 10 in Lisbon, Portugal. He gave an invited seminar at the University of Massachusetts, Ahmerst, on March 3rd. Moura ave an invited seminar at IBM T. J. Watson Research Center, Hawthorne, on February 24/ 2005. Saeed Aldosari, a graduate student working on Sensor Networks, was a best student paper finalist at the ASILOMAR Conference and received a best student paper award at ICASSP'05, see the ECE, CMU news. In March, Provost Kamlet, Dean Khosla, and Professor Moura represented CMU at the signing of a Memorandum of Understanding with the Government of Portugal represented by the Prime Minister and the Minister of Science, Technology, and Higher Education of Portugal. As a follow-up, Professor Moura with Professor Schlesinger and several other CMU faculty members visited Portugal May 24-27, see news1, news2, news3, news4, news5. Moura gave an invited lecture at the 2nd IEEE/CreateNet Workshop on BroadBand Advanced Sensor Networks (BaseNetS 2005), Boston, MA, on October 3. He was a Panel Member on Wireless Sensor Networks –From Sensor Networks to Smart Dust, at the 16TH IEEE International Symposium on Personal, Indoor, and Mobile Radio Communications, Berlin, Germany, September 12-14, 2005. He was an Invited Speaker and Panel Member,at the Robust Signal Processing and Stochastic Eigen-Analysis Workshop (SEA05), MIT, October 14-15, 2005. On July 24-27, 2005, he was an Invited Speaker at the Banff International Research Station Multimedia and Mathematics Workshop, Banff, Alberta, Canada. Moura was an NSF SRC Panel Review Member of the UCLA CENS, an NSF Science and Research Center at UCLA, June 15-17, 2005. He was an invited speaker at the 2005 ARO/AMRDEC Workshop on Information-Theoretic Image Processing on June 14-15 at the Redstone Arsenal in Huntsville, Alabama. He gave a plenary presentation, on "Sensor Networks: Detection and Estimation Under Constraints," at the Sensor, Signal and Information Processing Workshop, Tempe, April 28-29, 2005, Tempe Mission Palms, Arizona. Moura gave an invited lecture at the National University in Singapore on March 8, 2005. In November 2004, Professor Moura gave the Keynote Lecture on Sensor Networks: Challenges and Applications, at the III Next Wave Digital Home, Community Products, Services, and Opportunities Symposium, Institute for Information Industry, Taipei, Taiwan. In October 2004, he was an invited speaker at the Frontiers in Optics FiO'04. In September 2004, he was a member of the Panel on Sensor Networks - Interacting with the Real World, at the PIMRC'04, 15TH IEEE International Symposium on Personal, Indoor, and Mobile Radio Communications. In July 2004, he was a Plenary Speaker at the 2004 IEEE Workshop on Signal Processing Advances in Wireless Communications (SPAWC'04) and, also in July, a Distinguished Lecturer at the IEEE Sensor and Multichannel Array Processing (SAM'04) Workshop. Professor Moura introduced a new course in the Spring of 2004, 18-899 Algebraic Signal Processing.